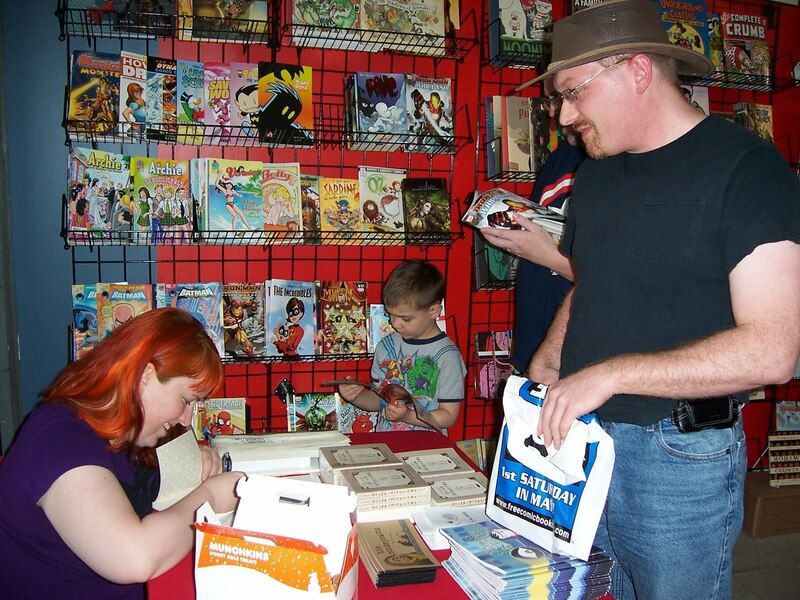 Kleefeld on Comics: FCBD Win! I was out of town this weekend with limited internet access, so apologies first for being somewhat MIA the past couple of days. 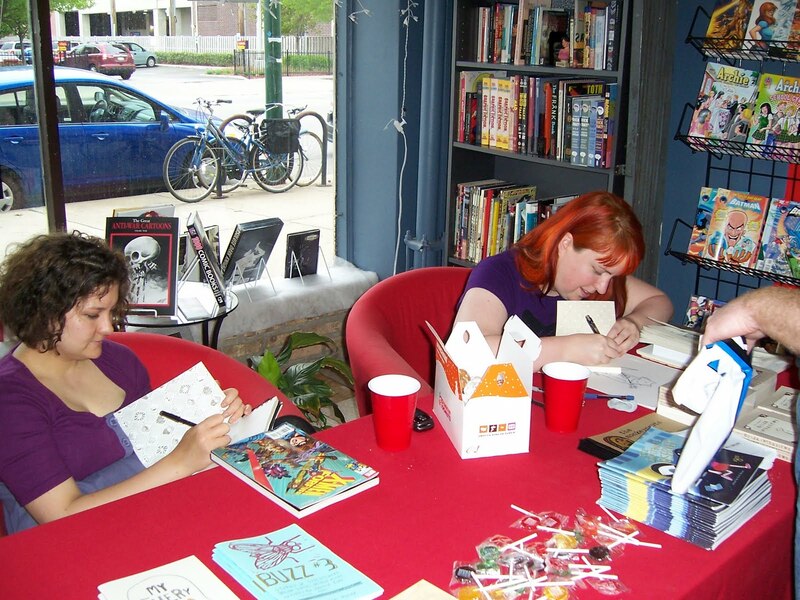 But I'm back now with my report on Free Comic Book Day! I happened to be in the Chicago area, where the S.O. and I visited Third Coast Comics. 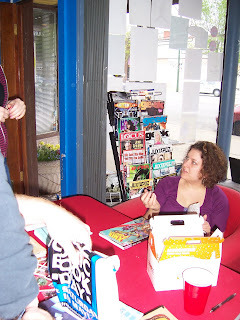 In conjunction with Free Comic Book Day, they had Sarah Becan, Corinne Mucha, Ben Rumback and Tom Kelley signing their work most of the afternoon, while Tim Seeley came by later in the day. We got there around 12:45 and the place was packed. Becan and Mucha were at a table up by the front window, while Rumback and Kelley were set up a little past the register. Another table square in the middle of the place held stacks of Free Comic Book Day mags. Between the extra tables and the (presumably) larger than usual number of patrons, it was a little tricky to get a good view of the store as a whole, but it seemed to have some more-or-less traditional areas designated. New Marvel and DC comics were on one wall, independents on another, graphic novels taking up some space a little further back with a collection of manga nearby. The walls had a mix of original sketches and (what looked to be) good color copies of classic covers blown up and framed. Terry, the owner/manager, was behind the counter in a pretty good Dr. Midnight costume and had a plate of cookies nearby decorated like the store's logo. In the back, there was something of an alcove in which a small lounge was set up with a couch, coffee table, a radio and a small TV. A door out the back led to an encircled patio area that was shared by several nearby buildings. I picked up several of the free books, of course, and grabbed Becan's The Complete Ouija Interviews and Mucha's My Alaskan Summer, both Xeric winners. By this time, several of the S.O. 's friends had arrived, so we decided to head up the street for lunch. But, only after I got my books signed and sketched in! We eventually left and went our separate ways, and the S.O. and I retired later to reading some of our new material (she was actually rather intrigued by Radical's offering and snagged that for herself). The free comics I picked up were essentially ones that I was already "sold" on anyway -- Oni, Red 5 and Archaia -- so it in that sense, it wasn't all that successful for those publishers. However, it did get me into a store to pick up the works of two Xeric winners that I might not have otherwise found and, in that sense, exposed me to some new comics in precisely the manner in which Free Comic Book Day is supposed to work. Plus, I had a damn fine time meeting and chatting with some friendly folks! So, all in all, I'm going to mark this down as the most successful/enjoyable Free Comic Book Day I've had the pleasure of attending so far! The free books I brought home (they let us take six) were okay, though that Red Five freebie...? Personally, I confess I didn't get the appeal. Regarding the presence of absence of back-issue boxes, I can see why some shops going for a sophisticated, bookstore look want to banish these in favor of new issues and collections only. It doesn't do much for me, but I can see the thinking. I don't quite see how that works out to demonstrating greater "[interest] in the medium as a whole," though. Well, speaking only anecdotally of course, I have one friend who took his daughter to a local shop this year for the free Fraggle Rock book and he claims they also got a free Popeye book. (A unique giveaway from that store, or was that buried in one of the other books and I missed it?) And in the process, they also bought some Disney comics too. As far as I know, it's her first exposure to comics with a longer form of comics than the 3-4 panels in newspaper strips. And from what my friend said of her general reaction, they'll probably be making more trips to that comic store now. Free Popeye book, eh? You got me; one of the free books was a kind of comic strip compilation I think? But even if Popeye was in there, I doubt most people would describe it as a "free Popeye book." Hm... I bought a Popeye comic at MidOhioCon last fall, which was a kind of promotional comic... but the impression I got was that not many were printed, so it would be surprising if some store were giving copies away. OK, I did some follow-up with my friend. Turns out that he picked up the "Popeye vs. the Ghosk" mini-comic that Fantagraphics put out last October to promote their Popeye hardcovers. Evidently, the store owner had a bunch extra lying around and was offering those out to patrons along with the regular FCBD material. Coolo. Nice to have a mystery solved, and to know that there was not really (in this case at least) a store handing out free copies of a book I paid cash-money for last fall.